NosDa Hostel & Bar i Cardiff, Wales: Bestill nå! 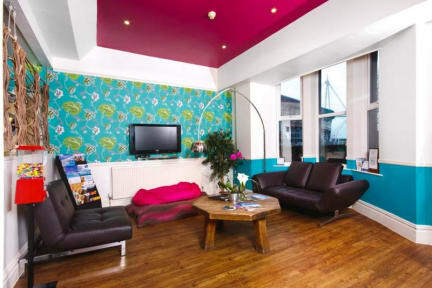 Want to experience the beating heart of Cardiff yet seek a calm, clean and comfortable environment? NosDa has the best location for a property in the Welsh capital. On the River Taff, NosDa is opposite Wales’ most iconic building, the Millennium Stadium (Cardiff Castle and Cardiff Central Station are just a stone's throw away). NosDa means 'good night' in Welsh and that is exactly what we are promising. We are the only property on the River Taff with a licensed bar and not only that, NosDa is an established live music venue too. What better place to stay than a typically Welsh property with local bands, Welsh food & drinks, and local artists bringing you closer to the Welsh culture. We regularly organise Open Mic nights & Live Music Events in our main Bar, and all Wales Rugby & Football International games are featured on our big screen. On a match day you can hear the crowd going wild at the Millennium Stadium, that's how close we are! Even though NosDa is one of the largest properties in Cardiff, it is proud to have the reputation of being friendly and personal with well-travelled international and local staff on hand 24/7. We have a great communal kitchen and plenty of common space to chill out, watch TV, read a book or catch up on emails. Meet your fellow travellers whilst tasting some of our local ales and ciders! * Breakfast available at £4.00 p.p. * Please note that a few of our rooms are situated above our public bar and can be noisy at times, as we regularly organise live-music events.